Home News Campus Millennials: Fighting For Change or Failing to Turn Out? Home is a confusing thing when you’re a college student. Is it where you grew up? Where your college is located? A little bit of both? With that all taken into account, where should your opinions matter? College students have the potential to influence elections. In fall 2016, total undergraduate enrollment in higher education institutions in the U.S. was 16.9 million students, according to the National Center for Education Statistics. Experts predict that number will increase to 17.4 million by 2027. However, students don’t always show up to the polls and are often discouraged to by community members. In Santa Cruz, some long-time residents argue college students’ opinions should not have local pull. They claim most voter-age students only stay in Santa Cruz for the duration of their schooling and that issues they vote on could have more long-term effects. This stance, among other obstacles, often prevents students from getting more involved in their college communities, which in turn lowers the college voter turnout. In a time of extreme political tension, less than 50 percent of U.S. college students voted in the 2016 election, according to Tufts University. But many students feel this is an essential time to be involved in the vote. This isn’t entirely college students’ fault. Because voting laws can vary dramatically between states, out-of-state students are at a disadvantage when it comes to registering on time. Mike Burns, the national director for nonpartisan Campus Vote Project, brings awareness to student voter issues and the disadvantages out-of-state students often face. In 2016, the number of out-of-state freshmen attending public universities had nearly doubled since 1986, according to the Department of Education. The voter eligibility requirements can vary and are often difficult for college students to meet. Some states require voters to show proof of residency such as a utility bill, something students living in campus dorms wouldn’t have. Other states expect an ID that includes an in-state address, which out-of-state students would be unable to provide. Burns said this “patchwork” of residency laws and voting requirements often confuses first-time voters and creates barriers for them. 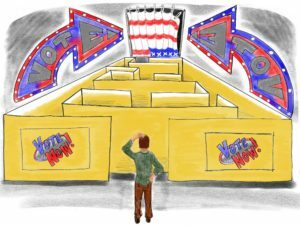 With the pressure of starting college in a new place, students often can’t go through the hassle of working through all of these obstacles to be able to vote. With how busy college life is, students struggle to find the time to register, let alone educate themselves on issues. As a result, some feel disconnected from the community. More often than not, college campuses are isolated from surrounding communities. It’s not only out- of-state students who have a hard time voting. However, Mike Burns thinks campus administration, faculty and students can work to change that. Despite the obstacles student voters face, Mietzel argued that now is a more important time than ever to vote.